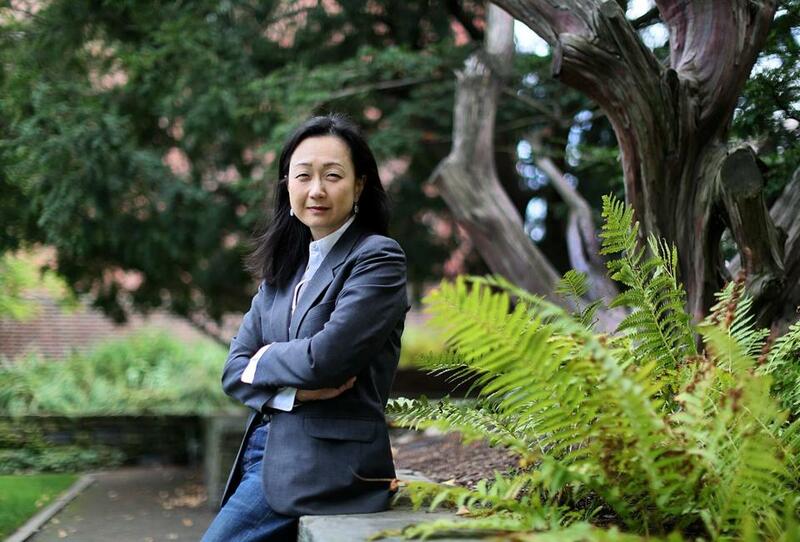 Min Jin Lee, best-selling author of the novels “Pachinko” and “Free Food for Millionaires,” is working on the third installment of her trilogy about Koreans while she is a fellow at the Radcliffe Institute for Advanced Study at Harvard University. She’ll speak about the lives of contemporary Koreans at 4:15 p.m. Tuesday, Feb. 12, at the Knafel Center on Harvard’s campus. The talk is free, but you can reserve a seat by registering online (radcliffe-nenmf.formstack.com/forms/2019_min_jin_lee_lecture). LEE: I just wrote an essay about bell hooks. I’ve been rereading her essays, which I would recommend wholeheartedly. I studied with her in college. What is weird is how radical she is now even though these things were written, golly, 30 or 40 years ago. BOOKS: Do you read a lot of essays? LEE: I like biographies because I don’t understand how to be an adult sometimes and find it helpful to learn how other people lead their lives. I just finished a wonderful book by Erica Wagner, “Chief Engineer,” which is about Washington Roebling, who built the Brooklyn Bridge. It’s a great father-son story and a great story about a marriage. Another really terrific biography is “The Last Tsar” by Edvard Radzinsky. It’s better than most John le Carré. I was a history major so I also read things that people would find dry and dusty. BOOKS: What’s a “dry and dusty” book you liked recently? LEE: A very concise history of Korean history, “Korea, Old and New,” written by five scholars, including Carter J. Eckert who is at Harvard University. If you wanted to understand the history of Korea this is very well written. BOOKS: What other books about Korea would you recommend? LEE: I also just finished “Human Acts ” by Han Kang. It’s a very spiritual book but also dark. People know her for “The Vegetarian,” but I think “Human Acts” is better. BOOKS: Did you grow up with books in Korea? LEE: When I was in Korea we had books. Then we came here and didn’t have any. My parents worked in their store all day. My sister and I were at home. We would go to the library in Elmhurst, Queens. We had a grocery cart, and we would fill it with books. I got such a head start from all that reading. BOOKS: Which books were the most pivotal for you? LEE: The books that changed my life are “The Bluest Eye” by Toni Morrison, V.S. Naipaul’s “A House for Mr. Biswas,” and George Eliot’s “Middlemarch,” my favorite book of all time. She writes the most accomplished community novel that has ever been written in English. “The Makioka Sisters” by Junichiro Tanizaki is like a Japanese 19th-century European novel though he’s a contemporary writer. When I read novels I want something to happen, and lots of cool stuff does. BOOKS: How else would you characterize yourself as a reader? LEE: I wasn’t an English major, and I don’t have an MFA. I’ve always read like a regular person. One book leads me to another. Like I read three volumes of Van Gogh’s letters, and he mentioned Balzac’s “Père Goriot,” so I read that. BOOKS: Have you tried to fill in holes in your literary background? LEE: Yes, but when I read Joyce’s “Ulysses” I was so intimidated. So I took a class at a community center for maybe $75. There were a lot of retirees and me. I loved the 70-year-old men and women who wanted to sit there and talk about a book. They felt like true readers. BOOKS: What draws you to a book? LEE: I need you to be a wise person. Like Penelope Fitzgerald. You read her and, wow, she understands people. Tolstoy had that kind of wisdom as well as generosity. You know he believes in humanity. LEE: I always write in everything I read, like little exclamation points. And I kind of get freaked out when I meet writers I like because I don’t want to know if they aren’t nice. If I met Charlotte Brontë, who’s obviously dead, and she said something dumb about me being Korean that would ruin my day.